Hello Andy, I think the patterns are made for cast iron and they are now making them in aluminium, this is where the shortages in the castings come in. I am hoping to make up a drop bed cart for mine and stick a saw rig on the back, we will see how we get on. Love your cart, looks just right for the engine. A creative mess is better than idle tidyness !! Other completed Economy models that I had seen on the internet often have 'Economy' and 'Hercules' transfers so I wanted them for mine. I couldn't locate a source for such transfers so I copied images from the Internet and spent hours and hours using Gimp Image Manipulation Program to resize and retouch the images pixel by pixel so that I could make my own transfers using inkjet decal paper. I was very pleased with the results. However, when I went to the Midland Model Engineering Exhibition I found that I could have bought the transfers from the Engineers Emporium, I hadn't thought of asking them in the first place ! Nice work on the transfers Andy, when looking at your engine it looks like the governor assembly mounting plate is thicker than it should be and has been cut away to mount the governor. I wonder if this was done to overcome the shortage in the castings!! I have made my plate up today, but I have not done the recess in the side of the block yet. I have no faith that anything will fit without making the part and then measuring how much to remove. If mine turns out as nice looking as yours, I will be very happy. 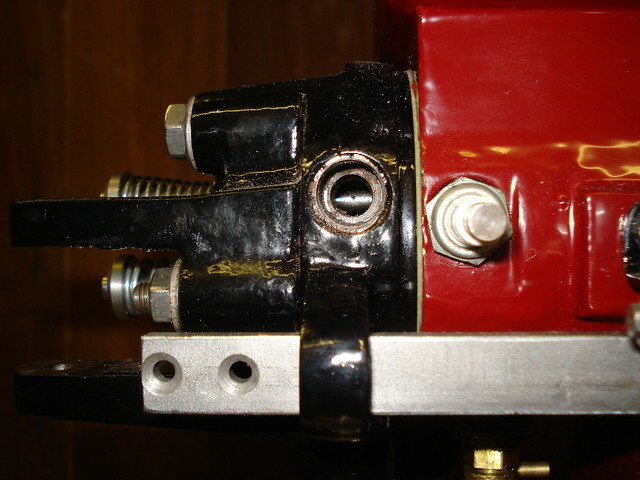 Hi Martin, there is a recess milled out of the side of the base where the governor assembly mounting plate fits. I'll measure the thickness of the mounting plate and see whether I have a photo of the recess for you on my PC tomorrow - I'm using my iPad at the moment. I doubt whether changing the thickness of the plate is significant but I can imagine amending it to help line up the pushrod. The finish on mine was due to filler and lots of rubbing down then several attempts at spraying paint. I haven't taken that much trouble finishing models I've made in the past however, will this be durable? Hopefully your aluminium castings will be easier to fettle. Hello Martin, the governor assembly mounting plate or 'timing plate' is 3/8" thick on my engine whereas my plans (drawing EF0102) specifies 8 mm. I attach a few cropped pictures of the governor assembly that show how the thickness of the plate was reduced to make room for the governor wing plates. 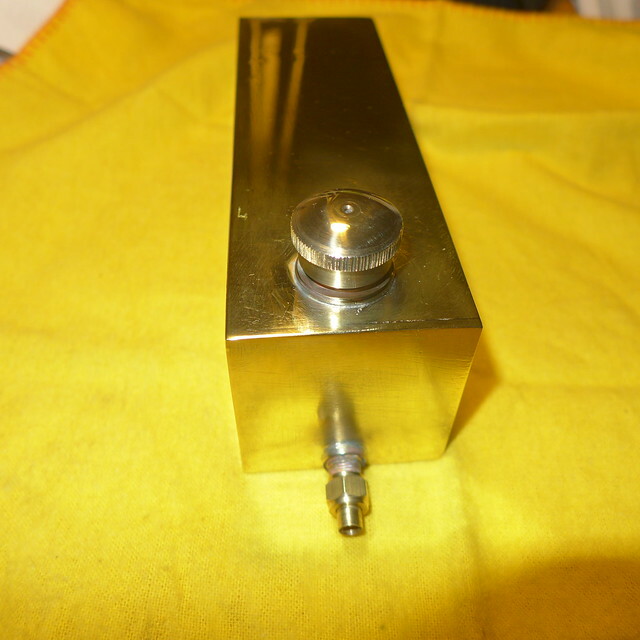 The recess for the timing plate milled into the side of the base is only deep enough to achieve a vertical surface for mounting the timing plate. I have drilled holes in flywheels on the periphery inserted magnets ,then used a cycle odometer suitably recalibrated to record the RPM ! Thanks for the pics Andy. The drawings that I have specify the plate to be 7mm thick, the plot thickens. This is the reason I am not machining any of the castings any further till I know by measuring that it is correct. There must be alot of variations on this model drawing wise. I have seen another set with the head mounting studs that were cutting into the side of the liner !!!! This is how the engine looks at the moment. I'm thinking about the location of the petrol tank and ignition system - whether to use a buzz coil or a MiniMag system. 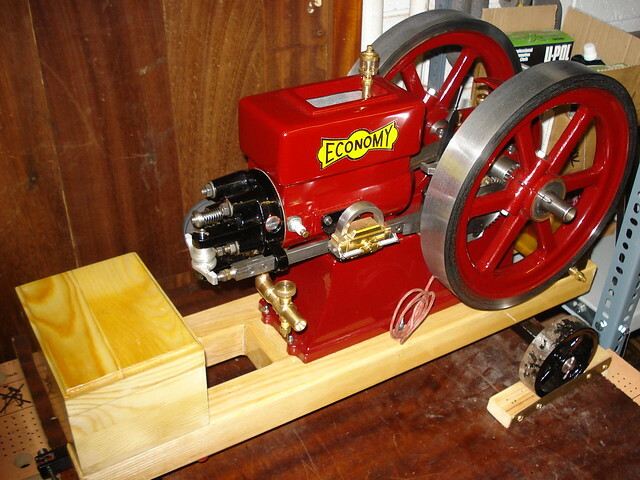 I decided to take the Economy and a couple of other model stationary engines to a club get together next Saturday 16/4 so I'm trying to finish off the model to make it presentable. The finishing details take a disproportionate amount of time, I hope it will run too. There are two holes in the cylinder head that were drilled to form the inlet and exhaust ports that have to be plugged afterwards. 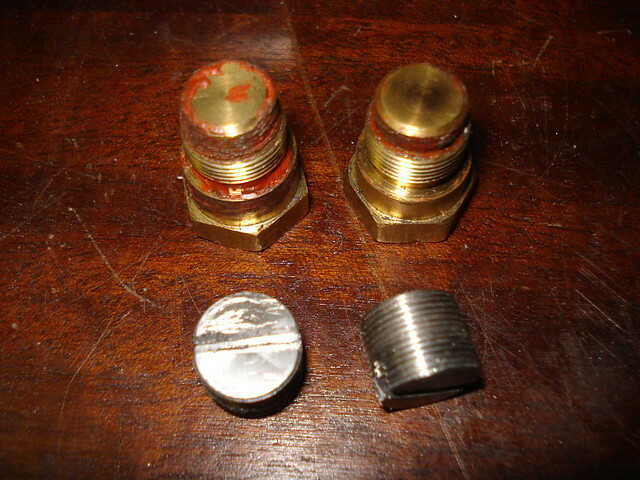 The original builder had made a couple of hex headed brass plugs that I didn't like. I assumed they were 1/4" BSP threads the same as the connections to the exhaust and fuel mixer and bought a couple of 1/4 bsp socket head plugs, they should have looked ok. Drat! he'd threaded the holes 1/2" x 32tpi so I had to make my own plugs from mild steel. 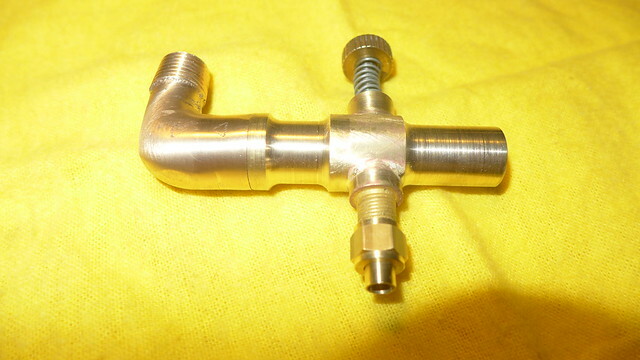 Now I put the head together using sealant, stainless steel elbow for the exhaust so it wont tarnish. Thanks Roger, I now have to decide where to position the petrol tank. 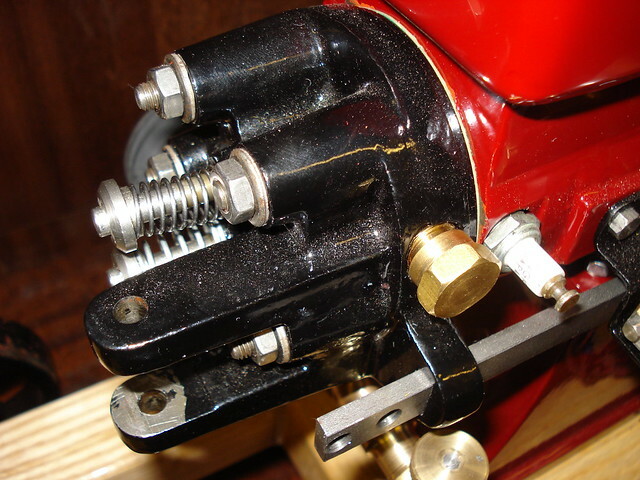 Behind the trembler coil close to the mixer or about ten inches away at the flywheel end of the trolley. The plans for the model position the tank inside the base of the engine. However, I prefer to be able to reach the tank particulaly to be able to drain it. 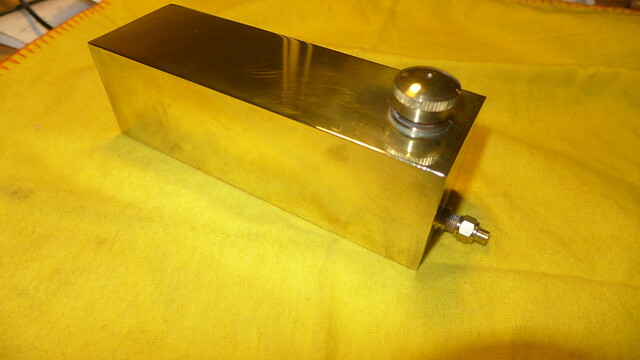 Some say it's risky having a trembler coil near petrol vapour which is why I put it in a box. 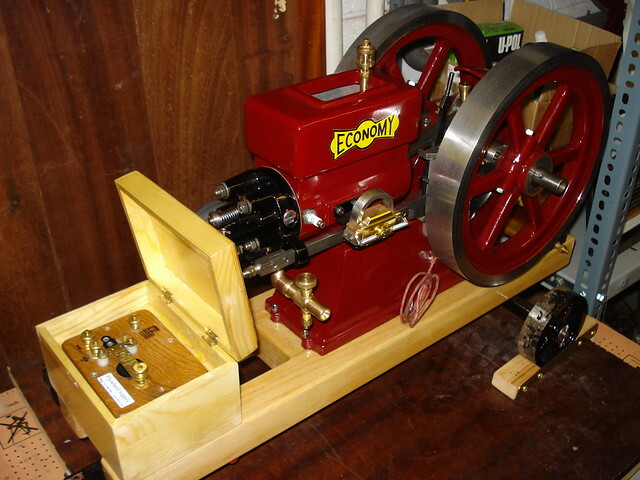 Has anyone heard of a trembler coil setting off petrol vapour from an engine? Had a hard time getting this Economy engine to run after its paint job. I've got blistered thumbs and aching hands after turning over the flywheels over and over again for a few hours - the compression is very good on this engine. I made up a starting handle in the end. 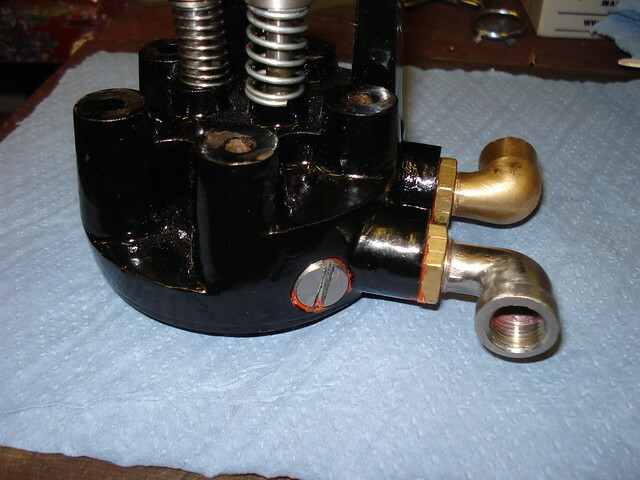 I knew that the two carburettors / mixers that came with the engine didn't work very well - way too rich. So I made my own simple mixer (just a needle opening a jet in a venturi) but that wasn't very good either, also too rich. The only device that worked well was a mixer borrowed from my Alyn Foundry RLE. 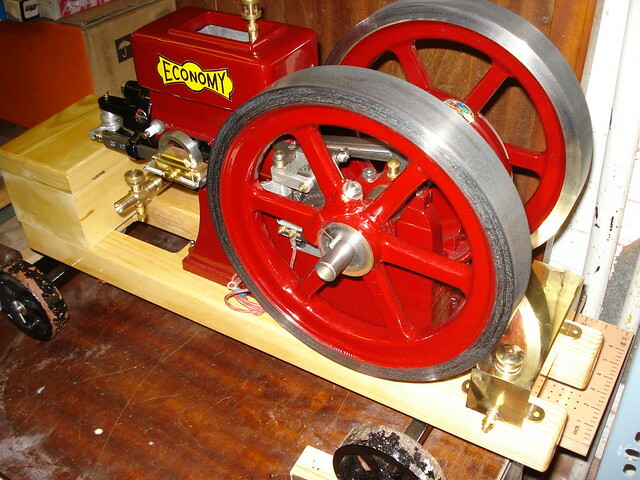 I'm hoping to exhibit the engine at my stationary engine club do next Saturday. 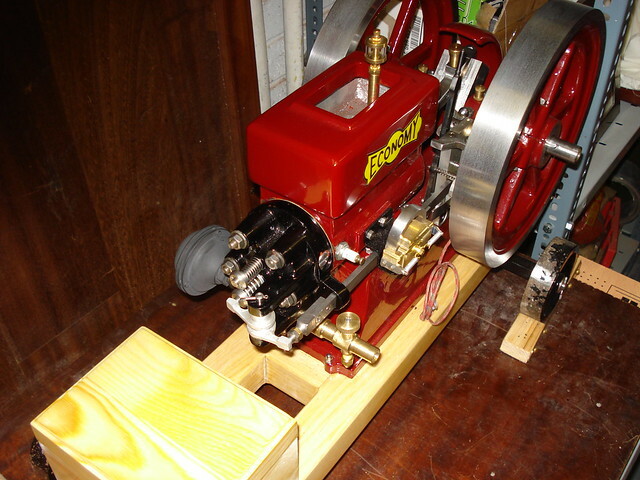 This is the engine running with my old home made mixer borrowed from my RLE engine this allowed the engine to run fast enough for the governor to work. Reckon I'll have to make and fit a much smaller jet and finely tapered needle and / or increasing the bore of the mixer might have the effect of leaning the mixture? Nice videos. What a difference in the second one. 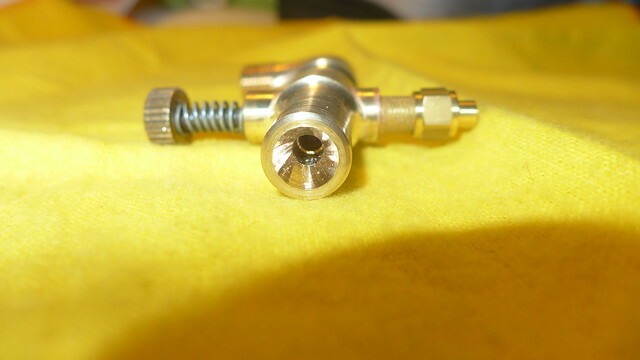 I do find that a lot of the H&M engine carbs are more on/off than a decent adjustment so tend to make then with finer threads and more pointe dneedles from the outset, even then they just need a tiny tun to go from closed to running. Bad Behavior has blocked 15689 access attempts in the last 7 days. Page created in 0.16 seconds with 19 queries.